This cute little guy is just waiting to infect you. In the late 1960s, scientists realized that seals had a virus that they could share back and forth with other pinnipeds. Over 30 years later, scientists have confirmed that it can be given to humans. Sealpox isn't as bad as it sounds. Although it shares a suffix with one of the most horrific diseases ever known, it's not in the same genus as smallpox. Smallpox, cowpox, camelpox, and a few others are part of the orthopoxvirus genus, which can cause serious fevers, vomiting, and death, as well as the tell-tale skin lesions. Sealpox is part of the genus parapoxvirus — a pox that also afflicts cows (cows just can't catch a break), as well as sheep, red squirrels, and red deer. The parapoxvirus is a pretty mild thing, even for the animals it preys on. They become lethargic, and develop unpleasant blister-like lesions on their skin, but as long as they keep feeding they can get healthy in a few weeks. What's interesting is how long it took to confirm that sealpox was a zoonotic disease, i.e.a disease that travels from animals to humans. 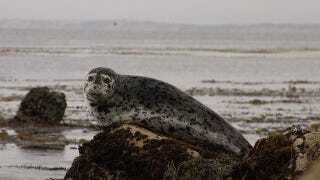 Researchers noted the disease in 1969, and over the years noticed how much it spread within seal colonies. When one sick animal came into a seal sanctuary, others would quickly fall ill, and researchers and volunteers had to be careful to keep it from spreading to pups. But the pox didn't restrict itself to one kind of pinniped. It could spread to sea lions and even elephant seals, and many suspected it could spread to human volunteers. Volunteers who got bitten became sick, and found lesions on their hands. But there wasn't a way to confirm the transmission of the disease, and as shelters began discouraging contact between seals and humans, opportunities became scarce. It wasn't until 2005, when a "marine mammal technician" got a bite to the hand and an unattractive blister soon afterwards that anyone could confirm that the virus can skip from seals to humans. Researchers did sequential analysis on the seal DNA and, well, the script for the world's cutest apocalypse pretty much writes itself.